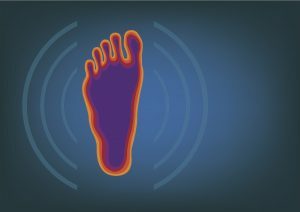 Plantar Fasciitis: Supports, Orthotics, or Walk on your Toes? Plantar fasciitis is a very common complaint in athletes — particularly runners or hikers. It can also happen in people who spend a lot of time standing during their work or in people who have gained significant weight. Women wearing high heels a lot have the same liability. People with plantar fasciitis feel extreme pain throughout the soles of the feet. The pain can be burning or shooting or merely aching, but it is disabling. With this condition it can become impossible to walk even a block! Moreover, it is a self-reinforcing condition. When there is such pain, you cannot get the exercise you need. You get out of shape, then it is harder to recover. Everything simply seems to fall apart! Orthopedists and podiatrists typically treat plantar fasciitis with arch supports and/or expensive orthotics. Orthotics are made by making a cast of the sole of the foot and then sending it to a lab who makes a plastic mold customized to your foot. You then place this inside your shoes in order to provide precise support. The theory behind this approach is that you need to relieve strain by providing support that your foot is not providing on its own. Perhaps you have flat feet with little innate arch support; orthotics or supports are designed to compensate. In fact, this provides some limited relief but in most cases it is not enough. An alternative method that works extremely well for runners and hikers, or people who have gained weight, is described beautifully in Christopher McDougall’s Born to Run [https://www.amazon.com/Born-Run-Hidden-Superathletes-Greatest/dp/0307279189/ref=sr_1_3?s=books&ie=UTF8&qid=1475197636&sr=1-3&keywords=born+to+run]. This book tells a very fascinating true story about ultra-distance runners, many of whom run barefoot! McDougall describes his journey through plantar fasciitis and many podiatrists and orthopedists. Finally, after reviewing the scientific research, he came to a conclusion opposite from the doctors. The closer one comes to barefoot running, the less the fasciitis! Coaches from long past discovered the benefits of barefoot running, and a tribe in Mexico that does ultradistance running (up to 100 miles!) relies on very very thin coverings of the soles with straps around the ankles. McDougall quotes research showing a direct correlation between frequency of running injuries with cost of the shoe! Companies developing softer soles, air cushions, or springs in the heels supposedly reduce trauma and strain to the foot, yet in fact they lead to more injuries! “Low impact” is counterproductive! The theory behind this approach is that feet evolved throughout eons of evolution in barefoot condition, actually encouraging flat-footedness! To strengthen the foot, it is important to tone and develop the intrinsic muscles of the feet. When these are strong, they take strain from the fascia. Gripping the ground and adjusting fluidly with each step keeps muscles and fascia balanced. Thick, “platform” shoes allow only limited motion in rotation or to the side, and all toes are moving together rather than independently. So minimalist shoes or barefoot running is optimal. An important effect of going barefoot or using minimalist shoes is that it helps greatly with aligning the whole rest of the body. “Platform” shoes have such limited ranges of motion that they strain ankles, knees, hips, and even the back! When there is flexibility and adjustment at the foot level, all the other joints and their ligaments and tendons are constantly adjusting as well — with each step, and in a balanced way! A further discovery I have found in my practice is to have people with plantar fasciitis to walk around on their toes as much as possible. This rapidly resolves fasciitis, because it develops intrinsic muscles of the feet! Bottom line: plantar fasciitis is easy to cure. Throw away arch supports and orthotics, and walk around barefoot, on your toes as much as possible. 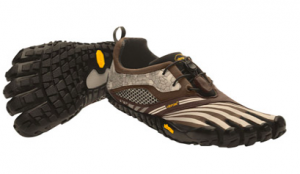 Then use minimalist shoes in your athletic endeavors! Another source of rapid relief if you suffer the pain of plantar fasciitis is to go to Coherence Apps Injury Module at https://www.eremedyonline.com/module/10/head-injury/. Like all modules for acute ailments, this brings rapid and safe relief. You will answer some individualizing questions. Then play the selected MP3 eRemedy directly on your cellphone or computer, according to the recommended protocol.